For a lot of people, Armored Saint are simply the band that Anthrax vocalist John Bush does when he’s not spending time with Scott Ian and co, an old-school heavy metal combo that releases albums every few years before splitting up again. Since 1991 they’ve released just three albums at the approximate rate of one every ten years, latest effort full-length number six La Raza being released a whole decade after 2000’s Revelation. So, worth the wait? I can’t pretend to be fully knowledgeable about the band, but this is a real step away from the pounding heavy metal of their earliest days, heading for a kind of modern hard rock sound with hints of old-school power metal dotted here and there. It’s bound to disappoint some, despite being a pretty good album in its way – as ever, Bush is a great singer, and the band aren’t far behind in providing a good dose of riffage to back him up. Of course, the temptation is to compare it to Bush’s time in Anthrax, and on first listens there aren’t that many differences – powerful stomper Head On would fit well on The Sound Of White Noise, for instance, with a little tinkering. Elsewhere, some tracks have a much more modern feel than some fans will be comfortable with, Left Hook From Right Field, for instance, a groove-ridden thumper sure to stick in your head longer than you’d like. Yet it’s hard to imagine Anthrax managing anything as tasteful as the orchestral intro to opener Loose Cannon, complete with acoustic strum, the ensuing driving rock subtly melodic and with an enjoyably catchy chorus that builds up to a nicely extended bit of soloing. The suitably laid-back Chilled is also a class above, as is the Latin percussion that opens the rather awesome title track. By the time you’ve got to Black Feet’s Southern-fried stomp, you’ll have got a handle on what this album is trying to do. 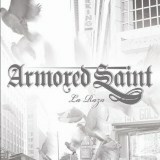 Whether it’s the catchy rock pounding of Get Off The Fence or Little Monkey, Armored Saint have produced a varied yet tightly-focused album full of good songs. Not great songs, admittedly – for some bands, producing an album like this after a ten-year break would be a sign of failure, and again, certain fans are going to be disappointed. Yet I can’t really criticise the band for producing songs that are as good as these, even if the album does take a slight downturn towards the end with the slightly dull Blues and Bandit Country. Besides, this will probably be the last thing that we hear from them until 2020, so those who don’t like it will have a decade to learn to appreciate it!